Is that you? Oh you are so cute!!! Hope you have a wonderful weekend Andrea!! Happy Birthday to ????? (Andrea, who are these people)? Whoever they are ...... HAVE A GOOD ONE! We're all wondering...is that you?? I love the photo!! 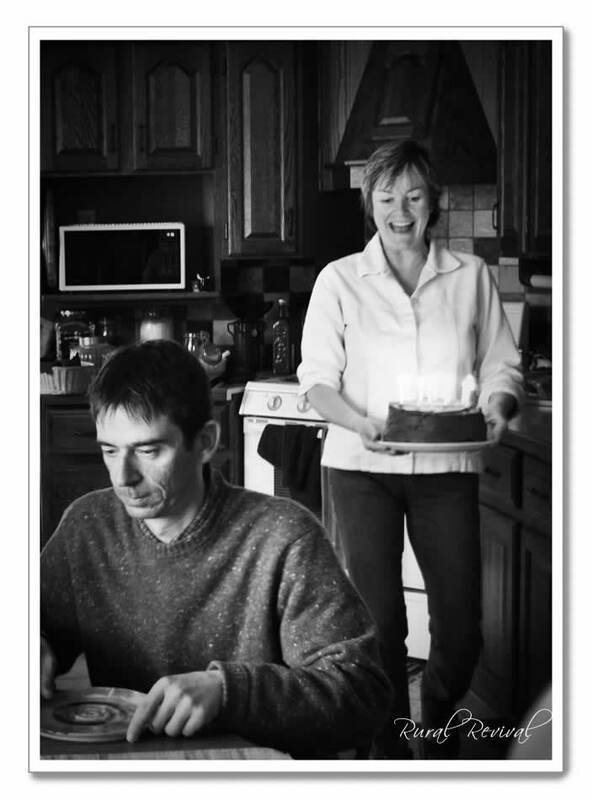 I LOVE this photo...I'm not sure if this is you but I LOVE the expression on the "cake barer's" face...PRICELESS! If the recipient is the fellow then it looks as though he has no idea what's coming...either that or he's REALLY ready for his cake they way he's holding onto his plate. Great photo and a precious moment. Thank for sharing with us! I hope your snow is nearly gone and spring has arrived on your farm. Our lilac buds are out and we have rain mixed with snow coming Sunday and Monday...go figure. Enjoy your weekend! Great photo! You're going to have to let us all know who the peeps are in it! Happy birthday from me too! You look lovely in the b&w picture! Neat photo: yes, I'm wondering, too, if that's you?! that is a great moment to be captured for sure! I love your Friday posts, sissy! Oh what a great photo capture! How sweet. Love the candids. I'm assuming this is from your brother's birthday? Gosh, that's a gorgeous shot! I can't think of a more perfect way to post a photo with no words, we're all thinking "HAPPY BIRTHDAY"! Haha, okay so it's not you, but I LOVE this photo!! I love the delight on your aunt's face and the anticipation on the face of the person seated...empty plate ready! !